When your child does something wrong, you punish them. Simple. Right? Not so simple when you’re raising a child with autism. We are all guilty of letting our emotions get the best of us sometimes. This is extremely true for children with autism. The amygdala is the portion of our brain tha t controls flight or fight. It processes all the sensory information that it receives and then reacts to it. We know that one of the challenges with autism is a difficultly with sensory input and perception – so I think you can see where this is going. If your body gets too overwhelmed by the sensory information it is receiving, then it is simply going to shut down and your “fight” responses will take over. This is what happens during a meltdown. We need to remind ourselves of the difference between a meltdown and a tantrum. A meltdown in short is beyond their control, and not done for attention. A tantrum stops when the child gets their way and they usually seek attention. For more differences, you can read more here. When your child is having a meltdown – it’s not their fault; whatever destructive behaviour that occurs is not their fault, nor is it yours. I know some parents repeat phrases (us included) of “nice hands, nice feet,” or tackle their child to the ground in bear hugs to provide a sensory input that tells their brains to stop. However, in most cases, there is not much that can be done until the meltdown is over. I also know some parents who have a “safe space” the child can go into where there’s no risk of injury to anyone around them until the meltdown subsides. After a busy activity/people-filled weekend, and a lot of routine changes including a different schedule of kids at daycare, MJ came home in a right mood and was extremely controlling of every situation. When she couldn’t get control at one point, she lost it and lashed out at my husband. Normally she saves the hitting, kicking, punching and biting for me, but tonight he got it because I wasn’t around. When I found out about it (about 20 minutes later), and tried to speak to her about it, she lied to me. Which is actually a bit of a milestone… but I digress. She has a desire to please and she was so worried about disappointing me, that she lied and tried to make it sound like an accident when in reality it was the day’s pent up frustrations coming out as her amygdala shut down. I punished her – but not for hitting Mark. I punished her for lying to me about it. I took away her Barbies for two sleeps (which may end up being more punishment to us!) I want her to know that lying is not ok – I am not going to be mad when she tells the truth, I may be disappointed, but ultimately, I want her to be honest about how she is feeling. It’s not ok to hit people, but I understand that sometimes she can’t control it and what we need to do is to teach her how to cope with the emotions and prevent her brain from shutting down. If we can’t get her to prevent the meltdown, then we need to teach her the appropriate outlets for letting off the steam. 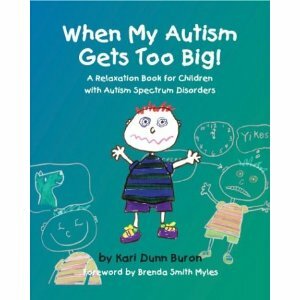 Once she calmed down a bit (she lost it again when she’d been caught and punished), she told me she knew her autism was at a “5” right then and that it was at a “4” for most of the day (We’re using the When My Autism Gets Too Big Workbook). The great news is that she is now recognizing it, what comes next is teaching her what to do when she recognizes it and getting her to take those steps. No small feat. Was she in control at the time of the event (i.e. a tantrum or a meltdown?) All tantrums in our house get punished. Will punishing it bring more attention to the behaviour and possibly turn it into a repetitive attention-seeking behaviour? What part of the event is it that I ultimately need to punish in order to attempt to correct the behaviour? Is this something that would ultimately be better-served by teaching coping skills for the trigger event, than punishing the act itself?